For industry giant Dell Technologies, the concept of support extends far beyond troubleshooting computer problems. The company has a history of supporting WSU through a strong recruiting partnership that helps place graduates in a variety of career positions. 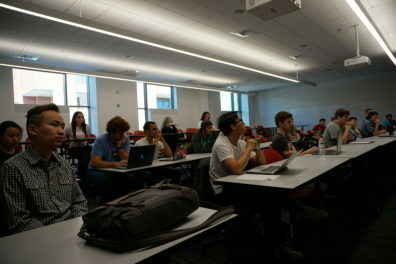 Recently, a team of Dell representatives visited the Pullman campus to offer a series of presentations and events aimed at educating and preparing students for potential careers in sales, marketing, supply chain, engineering, finance, law, management, operations, human resources and more. The Carson College and the Voiland College of Engineering and Architecture hosted the event. “Through this effort we hope to expand our recruiting partnership with Dell that will lead to continuous career options for our Carson Cougs,” said Suzi Billington, director of the Carson Center for Student Success. At the panel discussion, Dell employees Dana Young, Cameron Schwartz (’05 MIS), Grady Karp, Prashant Dongale, Srikanth Satya, and Nanda Rajasekaran spoke about their career paths and what students can do to prepare for careers in technology. 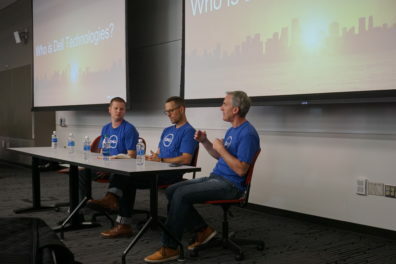 “At Dell we’re looking for people who take action and are task oriented,” Young said. Freshmen and sophomore interns should start building their résumés with project based learning and demonstrate an ability to link passion to a project. “We want to see juniors and seniors somewhat developed and showing a can-do attitude,” he said. Also, he advised soon to be graduates to always look for a bridge job that will provide additional skills need for a desired future job. Schwartz, an advisory systems engineer, and Karp, director of Dell’s Isilon control path organization, added that projecting technical curiosity, courage to seek new perspectives, and self-confidence during the interview process is advantageous. Karp also said extended knowledge of operating and file systems and data storage technology is particularly desirable in Isilon. or visit the Carson Center for Student Success.